I feel so incredibly lucky to have such a wonderful Mom! And even more blessed that she lives right around the corner and is able to be a part of our everyday life. Mother's Day is so special and I always try to bless my Mom with a little something. She loves homemade and so do I. Here is a list of some beautifully simple ideas for gifts. I think that any Mother would feel blessed receiving something heart felt and homemade! My sweet friend, Amanda at Homegrown and Beeyoutiful, has THE CUTEST tutorial on making a Mason jar sewing kit. Wouldn't it make a wonderful gift for a Mom? Sandy at C'est Moi had a darling chalkboard idea that would make a lovely gift. I think it would be such a fun addition to the kitchen or even the front porch! Last year, I made sugar scrub paired with ruffled dish gloves. You can read about the tutorials HERE. or a Ruffled Dish Towel! For book worms...how cute is this? Even little hands could make these cute as a button bobby pins:). 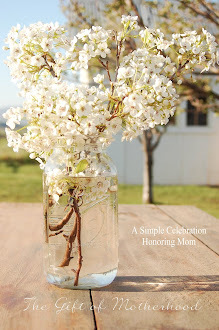 This is such a darling idea and sooo simple! Just wrap a container full of flowers in fabric and tie with a bow! This might be a little nontraditional, but I know my Mom would LOVE a lunch sack! And, of course, you could always make a soap dispenser. They are just plain wonderful and hard working...just like Mom! I hope this helps get your creative juices flowing and that you are able to bless a mother in your life:). Julia, my mom is 3 hours away, but she will bend over backwards to get here if I need her! I love so many of your ideas - aren't moms the best! I know that anything we make, or that I knit for her will bring tears to her eyes, and she will NEVER part with (because let's face it: she doesn't part with much, LOL) She is SUPER sentimental, which makes espousing a Handmade Mentality in our children (and ourselves) so much easier! I LOVE the clothespin magnet idea -- she can keep up with all the chidlren's letters and drawings, which she is always pining for! Love it!! My goodnes, these are the most clever of handmade ideas I've seen! I'm smitten by that teacup candle holder! Thanks for the shout out my friend. I'm thinking I'll make those rubber gloves with some dishwashing liquid for my mama and that teacup candle holder for my mil. Thank you so much for the ideas! I've been pondering what to give my Mom, and now I'm thinking a little kitchen gift basket would be lovely! My favorite is the cork boards and chicken wire frames. I also love your mason jar soap dispenser!!!! My friend just dropped off two boxes of ball jars the other day and then I saw Amanda's post on your dispenser idea that I had forgotten about. needless to say I will be making several of these, SOON! I also love the cloths pin magnet idea, I have already been doing that and saving it back for Christmas gifts for next year. Love all of the inspiration!!!! WOW WOW WOW..My mama has passed but my daughter who has three little ones would love some of these items. Thanks SO MUCH! how many wonderful and cheerful ideas! Darling ideas! Any one of them would make a lovely gift! So many great ideas, my mind is racing! Wow what great ideas... thanks for collecting them and sharing. Thanks for the wonderful ideas! So many of them too. Such lovely ideas! Thanks for posting a full list of inspiring ideas! A thank you is on the way in an e-mail.